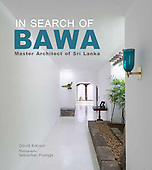 Geoffrey Bawa was one of the most significant Asian architects of the 20th Century and certainly the most important architect of post-independence Ceylon. His unique brand of regional modernism influenced a whole generation of architects across S.E. Asia as well in his native Sri Lanka. Steel Corporation Offices and Housing. Geoffrey Bawa. The Raffel House 1962-64 Ward Place, Colombo.